MENLO PARK, Calif.--(BUSINESS WIRE)--New research released today in the CipherTrace 2018 Q4 Cryptocurrency Anti-Money Laundering (AML) Report reveals that $1.7 billion in cryptocurrency was stolen and scammed in 2018 — a dramatic rise in criminal activity despite a slump in the market. Criminals need to launder all these funds in order to cash out before a wave of regulations go into effect in 2019. Theft from cryptocurrency exchanges accounted for the majority of the criminal activity: more than $950 million was stolen by hackers in 2018, representing 3.6 times more than in 2017. Lightning Network transactions: Enabling anonymous bitcoin transactions by going "off-chain" and now scaling to $2,150,000. 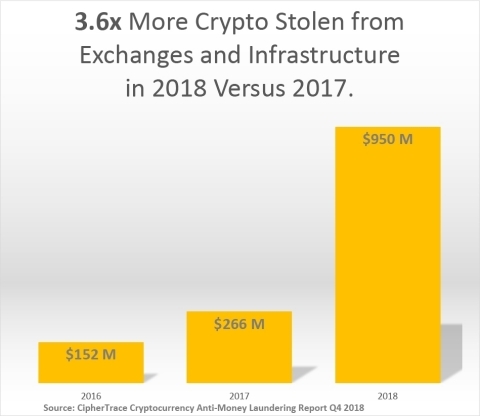 To download the report, visit https://ciphertrace.com/crypto-aml-report-2018q4. CipherTrace research shows $1.7 Billion in cryptocurrency stolen and scammed in 2018, outlines impact of new anti-money laundering regulations.